‘Years of Lead’ Haunt Italian Election as Political Street Skirmishes Return - Integration Through Media ....! 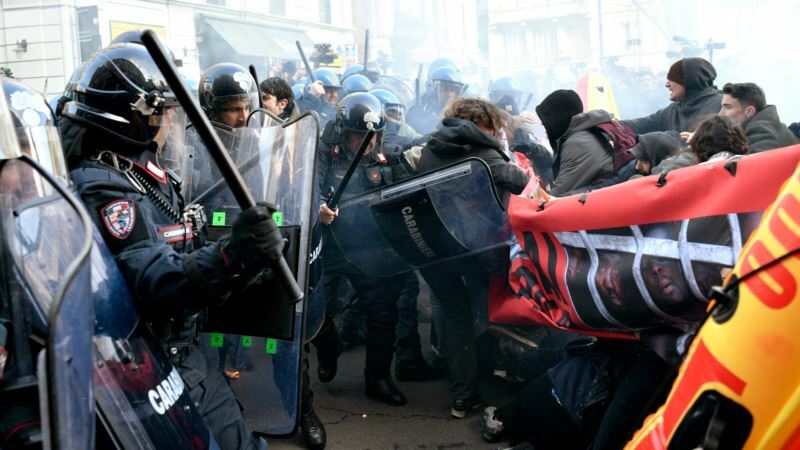 (VOA): Italy has had 64 governments since the World War II and many more prime ministers, but even by its own chaotic standards the country is mired in one of the most divisive and increasingly violent parliamentary elections in recent years. Rising political violence has prompted comparisons to the 1970s and early 1980s — the “Years of Lead,” as they were known — when the country was engulfed in political and social turmoil and buffeted by domestic terrorism launched by extremists on the right and left of the political spectrum. In Turin, six police were hurt Thursday as they battled anti-fascists trying to reach a rally mounted by CasaPound, a neo-fascist grassroots group turned political party. The skirmish was described by local officials as “very serious.” They said the protesters clearly “intended to hurt” the police. “Italians can no longer walk around this area peacefully, because of all the foreigners that continue to arrive end up here,” Carlomanno Adinolfi, a group member told reporters.